Having textured hair means constantly battling to keep our hair moisturized. Some of us even go on quests to find the perfect regimen and holy grail products that will keep our tresses happy for days on end. But coily hair has it's own unique moisturizing challenges. Because the circumference of coily hair is smaller than that of curly hair, natural scalp oils take longer to travel down the hair shaft, leaving coils more prone to dryness and breakage. Keeping your coils well hydrated doesn’t have to be complicated, however. It’s as simple as understanding your hair's porosity and knowing what to use for your curl pattern. Your hair's porosity is the measure of its ability to absorb and hold onto moisture, and the best indicator for how you should moisturize it. In order to find out your hair's porosity, take one of your shed hairs and place it in a glass of water. If it floats quickly to the bottom, then your hair has high porosity. If it takes forever and a day to sink, then you have low porosity hair. Lastly, if it sinks at a pace that is neither too fast nor slow, then you have normal porosity hair. 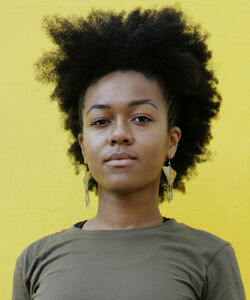 Low porosity hair is usually harder to moisturize since it is more difficult to get the moisture into your strands. Use more water based, liquid products that will moisturize your hair without coating it and making it greasy. Use a light oil like jojoba or grapeseed oil to seal your hair since heavier oils like castor oil or olive oil will be harder for your hair to absorb and will simply sit on top of it and weigh it down. If you really have an issue with your hair absorbing products, try to apply them to damp or dry hair since the strands will have released the water and be able to absorb the product. A temporary way to open up your cuticles so your strands can better absorb product is to do a baking soda treatment on your hair. Because baking soda is alkaline in nature, it will cause the cuticles of your hair to raise. Simply mix baking soda and water until it forms an aerated paste, apply it to the hair, leave it on for 15 minutes and then rinse. If you have medium porosity hair, you have quite a few options for moisturizing your hair. One option, the liquid, oil and cream (LOC) method, works so well because each layer of product seals the layer before it (eg. the cream seals the oil, which seals in the liquid). Apply a liquid leave in or moisturizer, then a light oil to seal it in and finish with your favorite creamy moisturizer or styler on top and your hair should be happy for at least a couple of days. If you have high porosity hair, it probably has a difficult time holding onto moisture because of its raised cuticles that allow moisture to be lost to the atmosphere. Apply heavy products to your hair in layers. Try applying a leave in, then a thick moisturizer, then a heavy butter to seal all the moisture in. To keep your hair moisturized throughout the week, mix your favorite liquid moisturizer or leave in with water in a spray bottle with a few drops of oil and spray it on your hair at nights then seal with a butter. To help close your cuticles temporarily to better hold onto moisture, try doing apple cider vinegar rinses when you cleanse your hair. Apple cider vinegar is acidic and will temporarily help to close your cuticles. Mix 1-2 tablespoons of apple cider vinegar with 2 cups of water and pour it over your hair after cleansing it, then dry it and style as normal. You can also try adding more aloe vera gel or juice to your regimen. The key to moisturized hair is healthy hair so keep a running appointment with your jar of deep conditioner, go easy on the heat and treat it gently. As always, remember to have love, peace and curly haired bliss. Coily ladies, how do you get and maintain the moisture of your locks?